Описание: Story Teller - Сказочник - Коллекция всемирно известных сказок - классическое издание журналов сказок для детей. Впервые выпущенное в начале 1980-х годов, оно было переведено на большое количество языков и пользуется заслуженной популярностью и по сей день. Каждый выпуск содержит несколько историй + аудио версии. Журнал подарит вашим детям чудесную возможность познакомиться с самыми популярными сказками мира и собрать их в одну коллекцию. Story Teller 1+2 - Story Teller will bring … stories to your children in a new way by combining the values of a book with the excitement of a sound recording. Сollection Story Teller combines the value of a fully illustrated colour book with a high quality, 50-minute tape. Whether your children are old enough to read and learn from the book, or simply ready to listen and follow the pictures, Story Teller will provide a wonderful and lasting collection for all to enjoy. Following the huge success of Story Teller in UK, the Spanish publisher Salvat acquired the rights for the Story Teller Spanish edition, Cuenta Cuentos. The first issue came out in March 1983. The collection had the same format as the British edition but, unfortunately, it was incomplete because only 39 parts were published. The final 13 parts and the Christmas specials were not released, depriving Spanish children of classics like Peter Pan and Alice’s Adventures in Wonderland, among many others. Part 39 was published in 1984. Raconte-moi des histoires (Tell Me Stories) French edition was published in France by Marshall Cavendish between 1982 and 1985. The series consisted of 26 issues and three Christmas specials which amounted to 728 pages of stories plus 130 colouring pages. There were almost 200 stories included and 21 hours of audio were recorded. Readers included Catherine Laborde (Gobbolino), Jackques Muller (Timbertwig), François Chaumette (Gulliver’s Travels), and Michl Elias (Pinnochio). Raconte-moi des histoires followed the first series of the UK edition closely, with only a few of the stories replaced in the French edition. Сказочник (Story Teller in Russian) is the most recent version of Story Teller. It was published with CDs from 2006 to 2009 by GE Fabbri Ltd. The series was published in 40 parts, with the involvement of Eden Phillips who was in the editorial board of the original UK edition. Readers included Kirill Kashlikov, Andrei Saminin, Rimma Zyubina, Lyudmila Ardelyan, Eldar Kurtseitov, Dmitry Tuboltsev, Lesa Samaeva, Mikhail Kukukuk, Each issue came with four or five stories with the CD running time of just under 30 minutes. In comparison, the UK edition had six or seven stories per issue, with the cassette running for 45-50 minutes. The German Edition - Erzähl mir was - loosely translates as “Tell me something” and the magazine was subtitled “The most beautiful children’s stories in the world to collect”. Like its UK counterpart, Erzähl mir was came out fortnightly and was available in newsagents or by subscription. Fifty-two issues were plus one Christmas special were published. The series was continuously numbered from one to fifty-two and was not split into two series like the UK and Italians edition. The story listing was very similar to the UK edition, though the covers often had different illustrations and did not follow the same colour scheme. Erzähl mir was carried the colouring pages that were so popular in the UK and in addition the German edition had activity pages at the back of each issue. 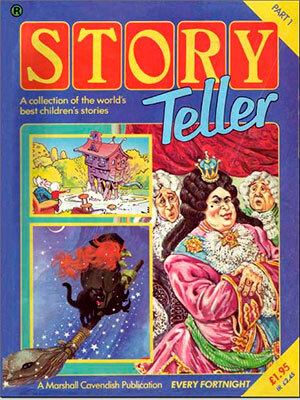 The Italian version of Story Teller was released as a two-series collection over two years like the UK edition between 1983 and 1984. Unlike the UK edition, however, the two series had different titles. The first series was called I Raccontra Storie (I Tell Stories) while the second was called C’era Una Volta (Once Upon a Time). The story listing in the Italian edition is very similar to the UK edition. In I Raccontra Storie, the poems from the UK edition were retained, though it goes without saying they were translated. However, in C’era Una Volta the poems were replaced with activity pages. ΆΜΠΡΑ ΚΑΤΆΜΠΡΑ - The Greek edition of Story Teller is called Άμπρα Κατάμπρα (Abracadabra). Paramythas would have been a more accurate translation of “story teller”. Unfortunately, the word paramythas was already in use as the title of a popular TV serial. Only 26 issues were published in Greece, which means we never got Story Teller 2. Greek celebrities who narrated the stories included Aliki Vougiouklaki, Kostas Rigopoulos, Katia Dandoulaki, Alekos Alexandrakis, Kakia Analyti, Kostas Karras, Nikitas Tsakiroglou, Zanos Dania, Sotiris Moustakas , Xenia Kalogeropoulou, Chrysoula Diavati and Martha Vourtsi. Aliki Vougiouklaki, the national star of Greece, narrated Gobbolino. The supervisiion and the direction of the cassettes were commissioned to another well-known actor, Stefanos Linaios. LUISTER SPROOKJES EN VERTELLINGEN - The Dutch edition of Story Teller was published by Lekturama and comprised 39 hardback books and each one had roughly double the number of pages as the UK edition. The series was not sold in shops but rather by mail order. To entice collectors, the first book was offered at a low introductory price. he stories were told by Frans van Dusschoten and Trudy Libosan. One element of the UK edition that the Dutch version retained, however, was the colouring pages. 6 Can You Keep a Secret? 3 Where Can an Elephant Hide? 15 Won't You Marry Me? 18 What Shall We Do with the Drunken Sailor?